I received a report from Kristalll, CEO of Valkyrie Professional Resources, in the I Whip My Slaves Back and Forth faction warfare alliance. 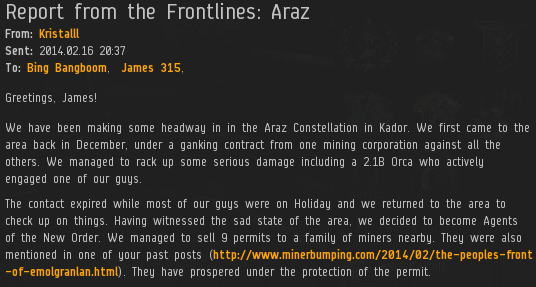 Agents in Valkyrie began ganking miners and selling them permits in the Araz constellation. Araz is located in the Kador region. Rebels in Kador can be unaccustomed to seeing vigorous Code enforcement. In time, however, the New Order always arrives. Rebel miners resisted the call of the Code. But Kristalll and her fellow Agents were about to prove their worth. Skeptics say the New Order isn't interested in stopping the bots. 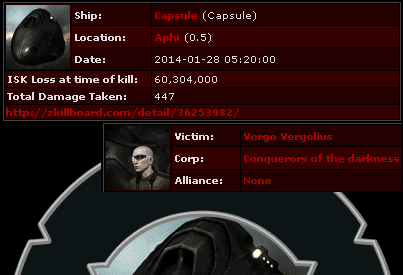 The truth--which any macro-miner in highsec will freely admit--is that the New Order kills bots all the time. Vergo Vergolius and his alt were prime examples. For a period of 53 minutes, Vergo's pod continued to move between the belt and the station, as if it were still a Mackinaw. It was only stopped when our heroes popped it. Kristalll had absolute proof that the New Order killed botters. She presented her case to the locals: Support the New Order and stop the bots! ...But the ungrateful, hypocritical rebel miners still wouldn't pay. They don't really care if we kill bots. 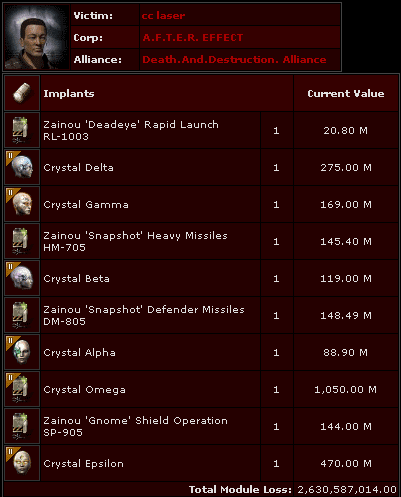 They only care about hoarding isk. 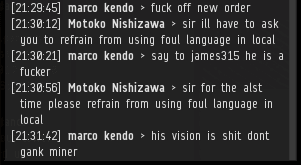 Stripped of their "bother the bots, not me" excuse, the rebel miners only become more foul. At the end of the day, carebears aren't concerned with logic. They'll say anything. When LordStarfire challenged an Agent to a duel against his Tengu, the Agent accepted. LordStarfire immediately withdrew the offer. Carebears always bluff. It's the only move they know. 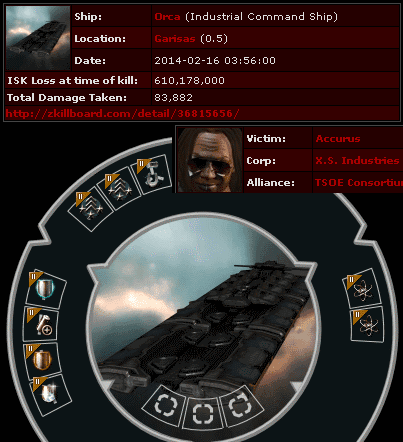 Kristalll learned of a highsec mining op sponsored by EVE Radio. Don't be surprised that some EVE Radio hosts would encourage bot-aspirancy. Their DJs often load up a long queue of techno music and go AFK. That's precisely how a bot would DJ. Since the EVE Radio mining op attracted rebels in ECM ships to protect the miners, cc laser assumed his Hulk was safe. The trouble with ECM is that the pilot needs to be at the keyboard. 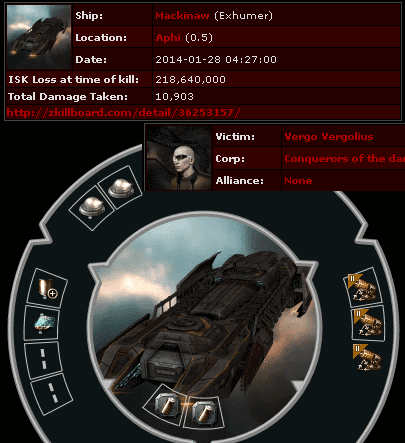 cc laser's Hulk was incinerated, and he lost a 2.6 billion isk pod to boot. Kristalll wanted an even bigger demonstration to drive home the message: Those who mine illegally are never safe. The result was a spectacular explosion. Despite being surrounded by rebel "guards", an unlicensed, fail-fit Orca was successfully ganked. EVE Radio had to admit that they could no longer protect the miners, and a general retreat was sounded. Another day, another illegal mining op cancelled. With a surplus of gank ships, our heroes went out and ganked two more Orcas. The work continues. There are so many more carebears who need to be broken, but time is most definitely on our side. 10/10 would definitely read again. Yep, I's say Kristall and her people are fighting the good fight out there. Keep up the good work y'all! Whoops, that should have been spelled Kristalll. with a cause as just as the New Order's, no one in the wrong can stand against it. Code FTW. Thank you everyone for your support! We've been drudging through the waste to fight for the cause! Highsec is worth fighting for! Was the botter reported? 'cause you can still gank then report the mongrel. Were out there doing our best and id like to thank the community for coming together to help me get the orca hat trick, and i hope i can get more people to come help ad the miners are shipping into harder and harder to kill barges and our meager numbers are having a hard time dispensing justice. Because you're intellectually challenged and it hurts your brain? Highsec carebear: We like to TALK about fighting back, but all it is is Talk. They sometimes like to yellowbox too. Start selling mining ships and modules along your route too. Back in the days of jet can mining I used to steal ore, then make mining modules to sell back to the local miners- with minimal skills so it was horribly wasteful. Not that it mattered since it was all stolen to begin with. I was dismayed at your inability to specify about mining permits. As an Orca pilot, surely they do not need to buy permits, as orcas do not mine?? My techno music was not that extensive, but if you would prefer, I can dedicate my next show to you on weds 2200 to us carebear botters all over new eden. Thank you for the entertainment. Even CC Laser had a giggle. Beautiful pod that was. I believe his comment was along the lines of "meh, that particular pod was getting the musty smell again". Mining permits are necessary for miners and miner support. CC laser: Didn't want those crystals anyway. As of writing this the total page view of minerbumping is 1.76 million. It is not our fault if someone mines in highsec without doing the proper research on the area he is mining in. The orca pilot was in a fairly expensive ship that takes a while to train for, he is by no definition or stretch therein a new player, and as such, has no excuse not to know about the code. Furthermore there have been scores of illegal orca kills posted on this site time and time again. and if i remember correctly a large portion of your mining group was taunting us about not having mining permits therefore knowingly participating in illegal activities. Woah... someone actually uses defender missiles?? ?